Now you're probably wondering how that can be possible. Well, the main reason this is so is because SNES was sort of the dark horse in my gaming years. I'm not saying it was a bad system (yeah, I exaggerated a bit on the title), I actually had some pretty good times with it. Though SNES gave host to many of my first game experiences, I can honestly say they could've been better. No, I don't think the Mario's and Zelda's are overrated, the main problem was: I didn't play them (or at least now enough). I got the SNES long before I started reading EGM and thus, wasn't aware of much that was good. Anyway, welcome to my first (and probably only) retro blog! I'm just going to get to the point now: this past month, after borrowing a SNES, I got to play it for the first time in years, and surprisingly, I love it! Super Mario World was a great start, definitely more addicting than any game I've played on current consoles; a game, I really, really should have played back in the day. I also played some Secret of Evermore (visually impressive! ), Super Mario Kart (I like a racing game! ), and Kirby (proving that I wasn't wrong about the crappy games on SNES!)... 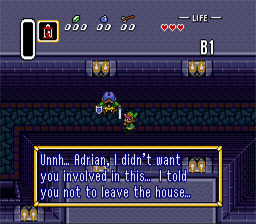 Oh, yeah, and I got to play Zelda: A Link to the Past again! First, let me say the SNES still has its faults... technically. Merely bumping the system can erase the save data on a cartridge! It happened on Super Mario World and Zelda... twice! And I hate to say it, but some games for the SNES graphics-wise, though seemingly nice at first, seem to get bland far faster than many PS1 games. Suddenly, I only was able to have the system for a few more days, and, without ever removing the cartridge, I decided to have one last go at Zelda. After staying up till 3am the next day, I did a "power-run" through a game for the first time for a very long time, and I haven't been more satisfied to finally beat a game since the last time I can remember! So with my incoming "25 Greatest Games" list (yes, it's still on its way), retro games may not be totally AWOL! This is for you retro games!